The United Nations established eight goals to be achieved by 2015. Gender equality and the empowerment of women was one of them. In Japan, has there been progress? In 2015, the Organisation for Economic Co-operation and Development (OECD) indicated Japanese women were better educated than the contemporary men. However, in the labor market, both the gender and wage gaps remained high. In 2014, the World Economic Forum ’s gender gap index ranked Japan 104 among 142 countries. OECD’s 2014 female executive index in corporate management was two percent, and in local governments, 3.3 percent. The Inter-Parliamentary Union ranked Japan 157 on the ratio of women in national parliament in 2015. This article will discuss why no change has occurred in Japan, with particular reference to the new Japanese government and U.N. policies toward the goal. Japanese women have long encountered difficulty in the workplace. The postwar traditional corporate and government employment system, supported through taxation and social security arrangements, largely was responsible for gender disparities in work and public life. In this system, “regular employees” are hired straight from schools and colleges. In the past, a majority of the workers were in this category. They were usually guaranteed annual wage increases, but often with long working hours. Women under this system, after being married or having a first child, were destined to leave the workforce. Japanese maternity and child care leave-of-absence policies and child care facilities were poorly organized. Further, the tax and social security system was in favor of women staying at home with one single wage earner, usually the husband. No incentive existed for women to work. Women who needed to earn money usually were bound to become “irregular employees,” working part-time or on fixed term. They received low wages with poor or no social security benefits. 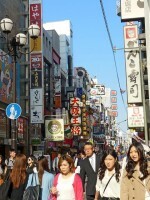 The recent Japanese economic situation, however, could not sustain the “regular employees” system. By law, the government insisted employers use the “irregular employees” system, which allows employers to fire workers at their convenience. Currently, 40 percent of all the workers are in this unstable and low wage irregular employment. However, the increase of the irregular employees has meant declining earning power and declining purchasing power. Widening gaps in wages and working conditions between “regular employees” and “irregular employees” has become a major economic problem. Young women (and men) in irregular employment are not encouraged to get married or have children due to their future’s uncertainty. Ever declining birthrates, a decreasing population and a labor shortage has become the reality in a country with a rapidly increasing elderly population. One-third of Japan’s population is 65 years old or older. Recently, the Japanese government organized new policies to redress declining population issues by promoting women empowerment and regulating the employment system. The government set the desired birth rate for 1.8 children per family and organized various plans to motivate young women (and men) to get married and have children if they choose. These plans also include improvements to maternity and child care leave-of-absence; establishment of better child care systems and more facilities; increased human resources for child care and associated costs; and the prohibition of long working hours. Most importantly, the government now tries to regulate equal pay for both women and men so the gaps of wages and working conditions “between regular and irregular employees” and between “women and men” are removed. The G-7 Ise-Shima Summit is currently taking place. As one if its main global development topics, this summit will deal with gender equality and women empowerment as a goal set in the 2030 U.N. Agenda (Sustainable Development Goals—which are the follow-up of the MDGs). The Japanese government will utilize the G-7 Ise-Shima Summit to connect these U.N. targets and promote its new policies. The country may need time, as those who have benefited by the traditional system may oppose the changes. International support will be useful in helping Japan to cherish the goals of gender equality and women empowerment. Author: Dr. Itoko Suzuki is a former chief, branch of public administration and governance at the United Nations and a former professor in public administration at several universities including, Ritsumeikan Asia Pacific University. Itoko can be reached at [email protected].